While a naturally airbrushed complexion would be ideal, pores are the reality for even the most camera-ready people. Pore size varies according to genetics and skin type. Those with oily skin or anyone facing a lot of pollution will find that their pores appear larger. Debris and oil become trapped in the pores, making them visibly darker than usual. 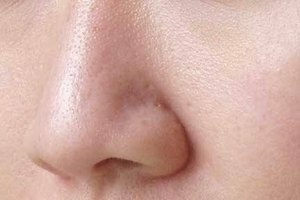 The nose is the most prone to blocked pores because it sits at the center of the T-zone, the oiliest section of the face. Pores on your nose can't shrink, but they can be made less noticeable with daily care. Cleanse your skin daily to remove dirt and oil that are congesting your pores. Pour a dime-sized amount of gentle scrub onto a facial cleansing brush. Position the brush beside your nostril, and gently rotate it in an upward circular motion. The bristles will help to dislodge dirt and oil from the small pores on your nose better than your fingertips can. Work the brush over your entire nose, concentrating on the sides. Always cleanse when you wake up to remove oils and sweat that have accumulated overnight, and before bed to dislodge pollutants, products and cosmetics. Use pore strips once a week to give your skin a fresh start. Pore strips hug the curve of your nose to pull out water, oil and impurities from deep within your pores, making them appear temporarily smaller. Pat your nose dry with a clean towel after cleansing. Remove the paper from the pore strip and place the sticky side over the bridge of your nose. Press the ends into the creases behind your nostrils, which collect the most oil. Rub your finger along the strip to secure it firmly. Leave the strip in place for 10 minutes. Grab one side with each hand and pull them upward to remove the strip. Use products to protect your pores in the morning, and treatments to help minimize them at night. After cleansing in the morning, smooth a pea-sized amount of oil-free moisturizer containing sunscreen over your skin. A small amount will prevent your nose from appearing greasy. Sun damage leaves pores vulnerable to pollutants and oils. Smooth a retinol-based cream over your nose at night. Retinol speeds up cell turnover to help unclog pores and make them appear smaller. Avoid retinol during the day, because it increases the skin's sensitivity to the sun. Makeup will disguise large pores on your nose for a seamless finish. Smooth a silicone-based primer over your skin and allow it to sink in for 10 minutes before proceeding with your makeup. Silicone blurs pores and helps foundation and powder to settle over them, and not in them. After applying any other makeup, dip a small pointed brush into a light reflecting setting powder and tap it on the container to remove any excess. Pat it down the bridge of your nose and down the sides. The illuminating powder will give skin a porcelain finish and distract from any visible pores. Teen Vogue: How Can I Make My Pores Look Smaller? 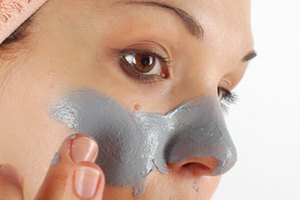 What Causes Large Pores on the Face?